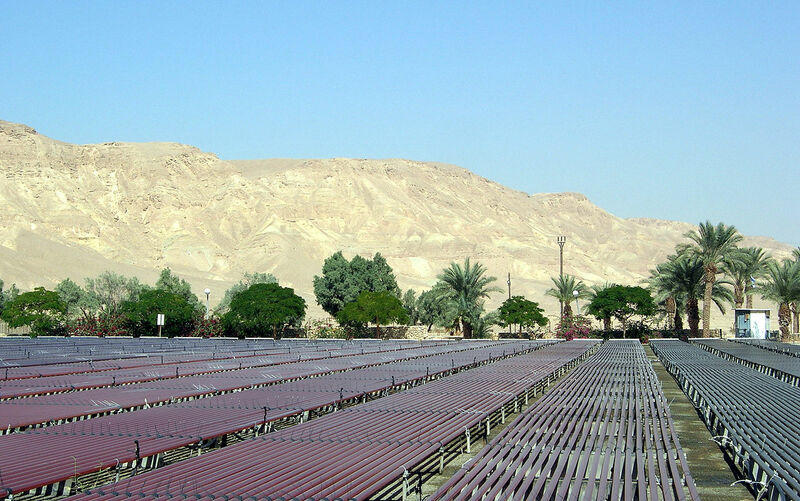 Total water use in Israel in 2013 was estimated at about 2,187 MCM. This represents water use in the agricultural, domestic and industrial sectors, water that Israel provides to Jordan and Palestine as part of bilateral agreements and water that is returned to nature, i.e. released back into streams for ecological purposes. Total water use is expected to increase to 2,672 MCM by 2020 and 3,571 MCM by 2050 (Fig. 5). 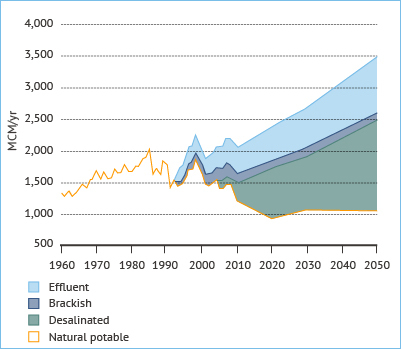 However, natural availability is expected to drop by 10-15% by 2050 as a result of climate change. The government plans to continue developing alternative water resources (desalination and wastewater reuse) and promote water-saving techniques to meet rising demand and maintain water security. 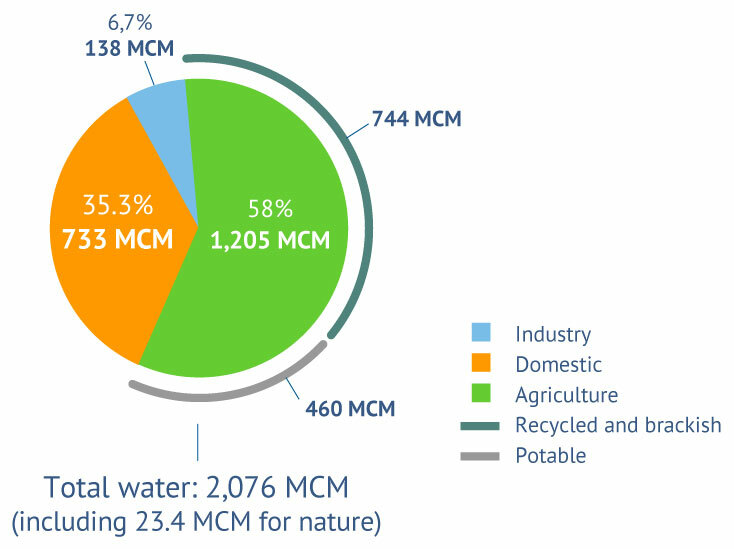 The agricultural sector is the largest water user (about 58%), consuming around 1,205 MCM of water in 2013. However, most of this water is brackish or recycled (744 MCM) and around 460 MCM is fresh water. Domestic water use, which includes water for showering, cooking, cleaning and recreational use, accounts for around 35% (733 MCM) of water use. 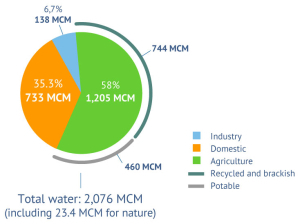 Industrial water use was estimated at around 7% in 2013 (138 MCM) (Fig. 6). Besides supplying water to the three main water use sectors, in 2013 Israel supplied Jordan with around 53 MCM and Palestine with 54 MCM in the West Bank and 4 MCM in the Gaza Strip as part of bilateral water-sharing agreements. Around 23.5 MCM was returned to nature. Israel’s agricultural output has been growing since 1948; however, today it only represents 2.4% of the GDP and 4% of exports. This is a significant reduction from 1960, when exports were estimated at around 30%. Nonetheless, agricultural development remains a priority, mainly for ideological reasons and land conservation interests. In 2011, total cultivated land was 283,000 hectares, of which 165,000 hectares was under irrigation. 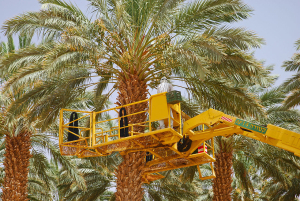 As it has a limited water and arable land, Israel has developed innovative agricultural methods and technologies. The large-scale adoption of low-volume drip irrigation systems, for example, has increased irrigation efficiency from 64% to 90%. Moreover, by combining the use of treated wastewater and drip irrigation, agricultural output has increased twelve-fold without increasing water consumption. Algoculture at Kibbutz Ketura in the Negev Desert. Photo: Remi Jouan. Data cultivation in Israel. Photo: Thomas Schmidt. Israeli Water Authority, 2015. Israel Water Sector: IWRM Model. Israel Ministry of Foreign Affairs, 2002. Focus on Israel: Israel’s Agriculture in the 21st Century.